RF elements | DoubleRadius, Inc.
RF elements is an innovative manufacturer of wireless networking equipment. The RF elements team is full of talented people thinking outside the box. They believe in the power of innovation, technology and creativity. This unconventional approach results in unique, game-changing products. RF elements technology delivers fast, massively scalable wireless while addressing the issue of RF pollution, proper use of spectrum and sustainable growth. Unique approach makes RF elements technology excellent in rejecting noise, eliminating RF system loss and achieving massive scalability of wireless networks. 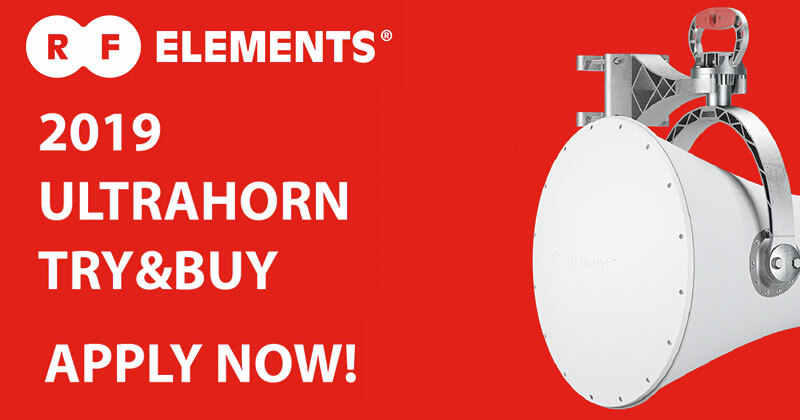 It's time to see for yourself why RF elements antennas rock! RF elements' Try & Buy Program proves the performance ahead of time. You only buy the product after you’ve tried it and seen the amazing performance for yourself! To apply for the program, click the orange button below, then click the red "Apply Here" button under "Try & Buy Application Form." The approach to the problem of RF pollution is logical and simple, yet truly unique. Instead of dealing with excessive amounts of noise by using complex and expensive methods, such as active filtering or gps synchronization, we focus on the fundamentals of correct signal propagation. RF elements tries to remove the source of these problems, not just deal with the consequences, as the competitors try to do. The approach is rather about cleaning the aether instead of better filtering. These revolutionary antennas are based on Horn antenna technology, which are re-invented for today’s complex challenges. RF elements have become the market leader in performance, cost, and spectrum efficiency. Their noise rejection features are unique and define a new class of wireless performance in a highly competitive market. To achieve superior wireless performance, there are two key issues: Noise rejection and RF Loss. The main reason for RF signal loss is due to the necessary transmission of the RF signal between the radio and antenna. Typically, signals travel via coaxial cables and connectors, where part of the signal is simply lost due to the laws of physics. From the point of RF loss, coaxial cables and connectors are a necessary evil. They are needed to do the job, but they add nothing to the signal but problems. RF ELEMENTS SOLVED THE ISSUE WITH RF LOSS...FOREVER! RF elements proprietary TwistPort waveguide connector has no cables and no coaxial components. It uses a waveguide to transport the RF signal. In comparison to the current market standard, such as RP-SMA coaxial connectors, TwistPortTM is virtually lossless. It is also extremely easy to use and durable. With current wireless equipment, increasing network granularity is simply not possible. Existing wireless equipment is hardly capable of delivering the performance needed TODAY, mainly due to low RF noise rejection and high loss. Also, ISPs often overlook the performance needed TOMORROW, rather worry about their current issues. This is now the past and the future is bright once again. By solving the two biggest problems, RF Noise and RF Loss, we unlock a whole new dimension of wireless networking. WISPs now can supply their increasing customer demands for connectivity by deploying more sectors with much higher density. They really can increase the granularity of their networks, and they can achieve it at no premium – something they have been dreaming about forever. With using RF elements technology, ISPs can instantly multiply the performance of their networks and value that they can deliver to their customers. DoubleRadius is a Value-Added Distributor of RF elements.